Dice iPod speaker worth a gamble? We suspect that these dice won't roll properly. 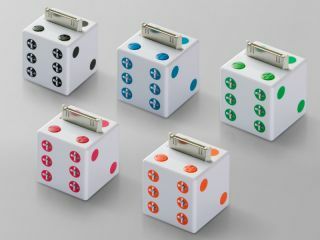 If conventional-looking iPod speaker systems aren't doing it for you, maybe Buffalo Japan's dice-shaped offering will. This cubic device plugs directly into your Apple music player (the Shuffle is the only model that isn't supported) and outputs 1 Watt of sonic power. There's a built-in volume control, too (this should go from one to six, surely?). The only problem is that the dice speaker is currently set for a Japan release only - it'll cost 2814 Yen ($33) when it's released their next month. We'll have to wait and see if Buffalo decides to, ahem, take a chance on the product in other territories.